Superfoods that south Indian grannies would approve of. 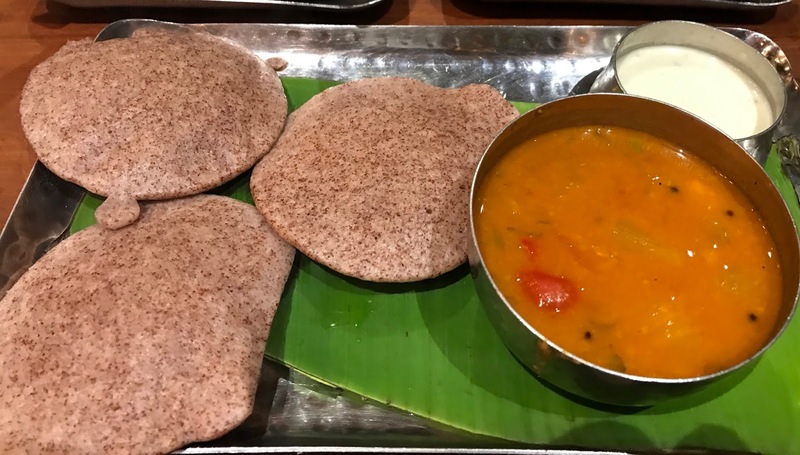 A millet feast at Mumbai&#39;s Madras Diaries. Superfoods that south Indian grannies would approve of. A millet feast at Mumbai's Madras Diaries. 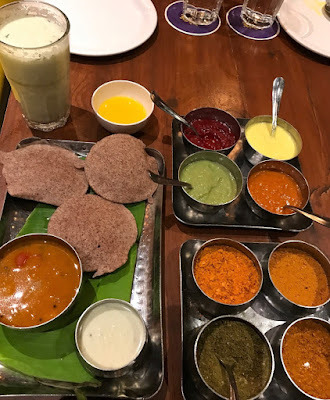 Highlights: Madras Diaries is a reasonably new south Indian vegetarian restaurant opened in Bandra. Bandra is considered to be one of Mumbai's trendiest suburbs and is today replete with modern western Europe and America inspired cafes. I had gone to Madras Diaries a few months back when it was new and was rather unimpressed by the food then. I went back last week and saw a complete turnaround in the food and the services at the Madras Diaries. I went back again a couple of days later and had a very good experience this time too. I ordered millet based dishes on both occasions. This post is about my experiences at the restaurant and also talks of why millets are important. I was most excited by my two recent visits to Madras Diaries and have been telling everyone about them. Which is why I thought that I should blog about it too. Madras Diaries is located at Bandra’s Waterfield Road and in the lane behind the (faux and no link to the Delhi one) Moti Mahal here. I had gone to Madras Diaries last November, soon after it had opened. I had gone there with high hopes then. Bandra, unlike Matunga and Fort to a very small extent, doesn’t have any South Indian vegetarian restaurant of note. 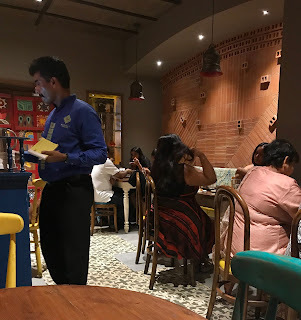 Yes, you do have the Udupi joints such as Amrit Sagar and Shree Sagar but I feel that they are meant more for a cheese pav bhaaja, shezwan sev puri and paneer Mexican pizza chomping eclectic crowd, Folk who do not mind it if the the sambar is served sweet. Very sweet. Other south Indians tend to ascribe this sweet sambar to those who live in Karnataka and assure me that there's isn't sweet. I plan to go to Mangalore soon to see if the sambar there is indeed as dessert-like as it is in Bandra. I don’t feel motivated to travel to Matunga, said to be Mumbai's mini south India, to be honest. 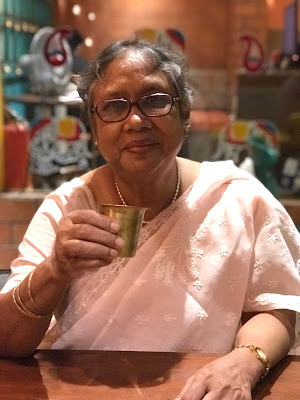 My travels take me to south India a decent intervals and I get my fix of south Indian tiffin fare at restaurants when there and most recently at the house of South Indian food maven and evangelist Shri Bala, whose birthday it is today, in Chennai. I must clarify at this point that I am am not a south Indian myself. I had learnt to love the basic dosa and medu vada from the south while growing up in Kolkata. Mumbai exposed me to more variations such as Malayali and Mangalorean and then my travels to even more. I must say that I enjoy their vegetarian fare the most. I am no expert though. I went to Madras Diaries, soon after it opened, hoping to savour some of the culinary magic that I have experienced during my travels to the south. The restaurant was not open for breakfast back then ,though it is now. So I dropped in one evening instead at around 6pm on a weekday. The visit was a bit os a disappointment, possibly because of the high expectations I had basis what I had read about it Madras Diaries on social media. The place was empty and that is always a turn off for me. The staff seemed to be completely clueless about the menu and could not answer any of my questions about the food. The idli that I ordered was admittedly soft. The sambar served with it though was cold, or lukewarm at least. Not, I repeat not, sweet. The Dhavengere benne dosa tasted like plastic and was glistening like a surgeon’s gloves. Presumably with butter as benne means butter. The dosa was very thin and nothing like the dual textured, crisp outside and soft inside CTR Bangalore benne dosas that I had in mind. While placing the order, I had explained what I had in mind but did not get a clear answer from the person taking the order and had tried my luck but to no avail. I had a filter kaapi too and that seemed competent. I am no expert on that. I quickly paid up and moved on. Ruing the waste of money and time. I didn’t write about my experience about from the odd tweet. I do try out new places occasionally and often find the food to be pedestrian. I don’t really feel motivated to write about them though and often keep quite unless someone asks me about it. Especially since I don’t really do restaurant reviews these days. Despite my experience to the contrary, I continued to see the occasional complimentary post about Madras Diaries on social media. I was sceptical of them. Then one day, I came across a status update praising it highly from a former senior of my mine from my market researcher days, Ramiah Balachandra on Bala as he is knoen. He is a Tamilian and a man with a taste for the good things in life. Including food. He is a good cook too and is adept at making both great idlis as well as pastas. This made me decide to try out Madras Diaries once again. I got the opportunity to do so when I was returning home with my mother, who is visiting us these days, from a doctor visit last week. We decided to go for a snack before heading home. Given our shared love for south Indian food, I took her to Madras Diaries. It was a weekday evening once again, but this time the place was not empty. It was half full. There were many more serving staff around compared to the past and this time they were on the ball. Unlike the last time, when they looked at me blankly when I asked them about the composition of the different podis (masalas) on offer, this time one of them brought a deck of chutneys and explained what each was. When experiencing a cuisine I am not familiar with, I do like to know more about it as this helps me understand what I ate better. I was happy to see the service at Madras Diaries improve significantly on this count. I wanted to know about the composition of what went into the multi-grain dosa which are on offer at here. The lady taking our order wasn’t sure but promptly called the slightly elderly looking manager. 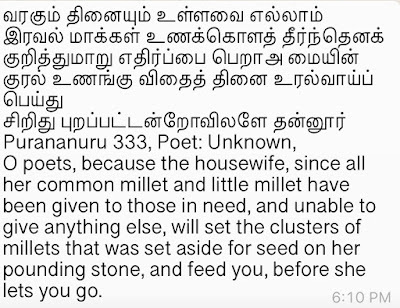 “Til, jowar, bajra,” he explained. He was not very loquacious but my questions were answered satisfactorily. That's all that one wants after all. The next question was, how would the food measure up. Would it be as patchy as it was the first tome around? The menu at Madras Diaries looked extensive, entirely South Indian as far as I could see with no pretend pizzas or nachos, popular in local Udupi. The menu seemed to have some representations from Kerala (appam and porotta) and Andhra (pesarattu) and Karnataka (ragi), based on my limited understanding of South Indian food. Not just ‘Madras’. Though in the politically incorrect days of my childhood, we did refer to all south Indians as Madrasis. I spotted millet based dishes and decided to go for them. Millets are considered to be super foods indigenous to India. They have a low GI which helps counter diabetes. They grow in arid conditions where water would be scarce and hence don't deplete natural resources. Millets have been grown in India from ancient times though their consumption has dropped in recent years. Parts of South India have a rich tradition of growing millets and the agricultural minister of Karnataka, Byre Krishna Gowda, has been at the centre of the recent movement to popularise the use of millets. They are used in the local Maharashtrian cuisines of Mumbai and in neighbouring Gujarat and in many other states of India too. Ironically, you will rarely find millets served in the cafes of Bandra though you will quinoa and avocado options, both are imports and expensive, available by the dozen here. In Mumbai, you will find millet based dishes such as jowar bhakri and the multi-grain thalipeeth served at vegetarian Maharashtrian restaurants such as Aaswad, Prakash, Aram Vada Pav and Vinay Health Home and the vade (a multigrain puri) at most Malvani and Gomantak restaurants. Gujarati restaurants such as Soam offer jowar rotis and other millet based dishes. Among the new age places, Bombay Canteen has a popular salad which incorporates millets. The doctor visit earlier that evening was to a diabetologist after all. I remembered Krishna Byre Gowda, minister of state for agriculture in the Karnataka government, extolling the virtues of millets and their ability to counter diabetes, when speaking at the Tasting India Symposium. Diabetes, as he pointed out, is a big menace in India and is a far bigger problem than gluten intolerance which people in the upper sections of urban India, modern cafes and writers often obsess with. 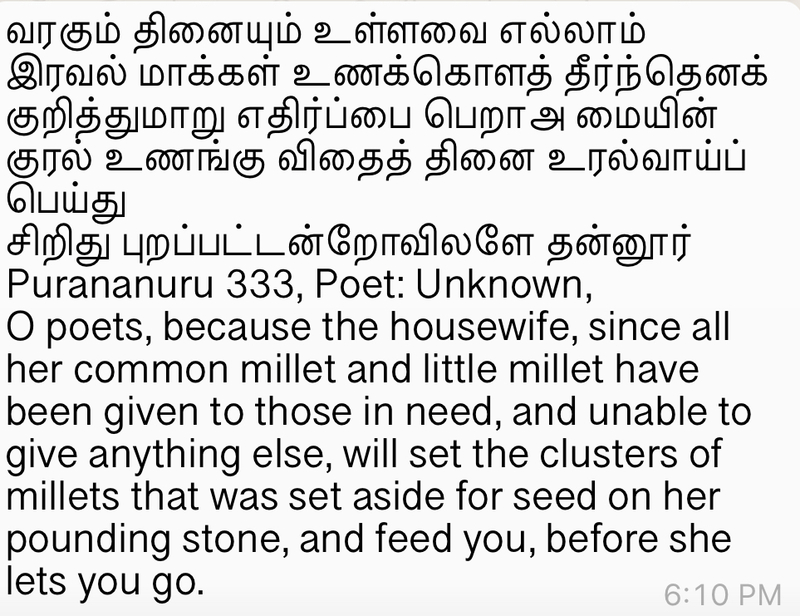 Shri Bala tells me that the use of millets finds a mentions in one of the oldest Tamil poems from the literature of the Sangam era. I ordered a plate of ragi (nachni/ finger millet) idli. Idlis are steamed of course and are considered to be healthy in any case. The use of ragi instead of rice further helps bring down the glycemic index of the dish I guess. The first time I had a ragi based dish was in the form of a ragi dosa made by a senior chef at the Whitefield Marriott Hotel in Bangalore, a local Kannadiga. He had told me that ragi is a big part of the local diet and is considered to be good for one's health. The dosa there was so delicious that I asked for one the next day too. He most kindly packed some powdered ragi to take home back then. The ragi idli arrived quite promptly, and it was served hot and steaming. It was not as fluffy as the rice idlis of Murugan’s or the ITC Grand Chola, of Chennai. That was the result of using ragi and not rice I guess. The ragi idli at Madras Diaries had a nice nutty feel and texture to it. It tasted quite nice to us though it was the first time that my mother and I had tried one. What livened the idlis up was the podi (ground chilli and spices). I asked for some ghee. My travels to Vizag and Hyderabad and Chennai had taught me that you need a drop of ghee to get podis to come alive and that is what happened here. Interestingly, while the podis were served on the house, the ghee was charged Rs 30 extra. Podi without ghee doesn’t make sense so giving one on the house and the other not seemed strange but that’s their call. The sambar was thick AND not sweet unlike the dessert like ones you get in Udupi restaurants here. It was served hot this time and not lukewarm unlike during my first visit to Madras Diaries. Earlier in the evening, our doc friend had told us that dosas should always be paired with sambar, especially for diabetics. The protein of the lentils balances the high GI index of the rice batter of dosa according to her. “Part of our ancient wisdom,” she said. I pointed out that the sambars that we get in restaurants in Bandra are full of sugar and that defeats the purpose. At Madras Diaries, mom and I happily wolfed down the sambars with a clear conscience and called for seconds too, which were not charged for just as they aren’t at Udupi restaurants either. The sambar wasn't sweet here mercifully. The other dish that we had that evening was the navdaniya dosa. A multi-grain one with til, jowar and bajra according to the manager. This was neither too crisp, nor too soft. It was visibly cooked in minimal oil/ butter. Tasted pretty good and the mix of grains added a dimention to the taste that different from that of rice and urad dal batter dosas. This dish at Madras Diaries, like the ragi idli, turned out to be a good discovery. 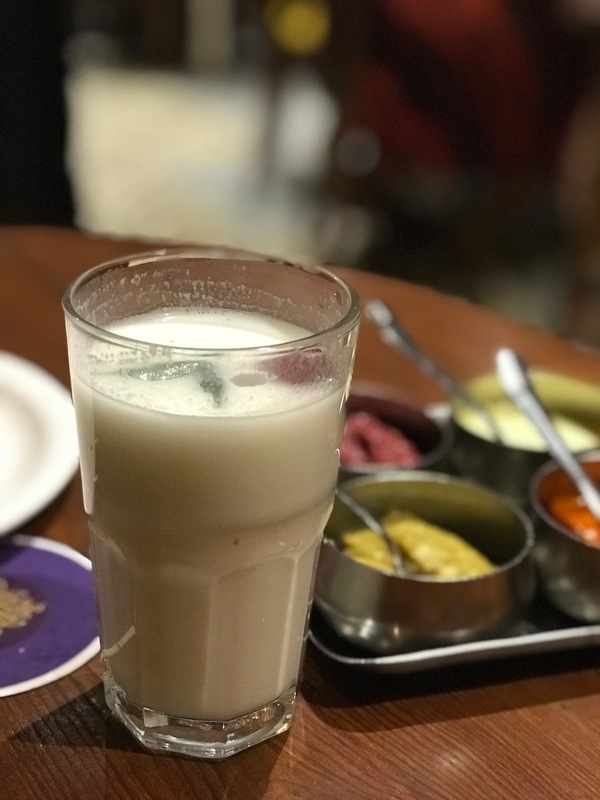 I had a masala chhas (butter milk) which was nice and refreshing. Mom had a filter kaapi, served without sugar as requested. The only problem here was that the coffee was served with the food so it did get a bit cold by the time my mother finished eating and started on the coffee. In the humbler Amrit Sagar, they do ask you about when you want your coffee to be served and they should do that here too. 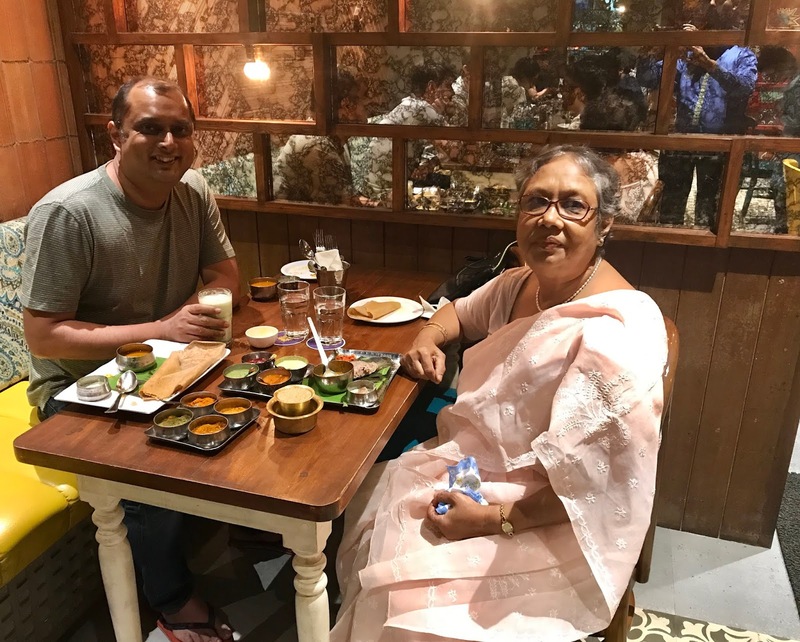 We were quite pleased with our overall experience at Madras Diaries and mom insisted that she treat me. The outing reminded me of the stops she and I would make at Rim Jhim, the south Indian restaurant that was locted at Kolkata’s Minto Park, after she would take me to my weekly orthodontist visits when I was in school. Thirty odd years later, Rim Jhim has shut down. Minto Park is called Shaheed Bhagat Singh Udyan now. 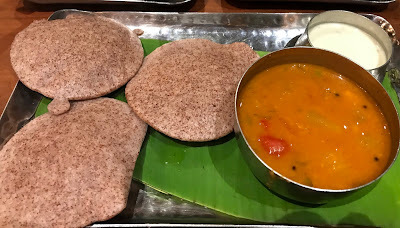 Our ordering of masala dosas and medu vadas with gay abandon has been replaced with ragi idlis and multigrain millet saada dosa, with steamed dishes and millets being preferred to fried dishes, rice and potatoes, as we both grow older. Yet, one could say that a bit of Calcutta in the 80s nostalgia was recreated in Mumbai that evening for a Bengali mother and son duo. Ironically over idli dosa from the south. This story could give fodder to those who claim that it is the idli dosa and not the khichdi or the biyrani (my choice) that should be called the national dish of India. There’s more to this story though so please don't go. Emboldened by my second visit there, I went back to Madras Diaries a couple of days later. Was there a twist to the tale this time you ask? Not really. I have no goss or rants for you I am afraid. It was a Sunday evening this time and the place was packed. The service was still attentive and the food was brought to each table promptly. The elderly manager came to take my order this time. On my asking, he explained the difference between the two butter milks on offer. The masala one, which I had the previous day, was 30 rupees more expensive. The latter was seasoned just with chillies and curry leaves he explained. I went for this and it was just as refreshing as the masala one. Possibly more so, given that the flavours of the chillies and the curry leaves added a sharp burst of freshness to the drink. I continued with my millets exploration this time too and went for the ragi utthapa. It was served nice and hot once again and this time with a sprinkling of podi spices on the top. They way they often do in the south. 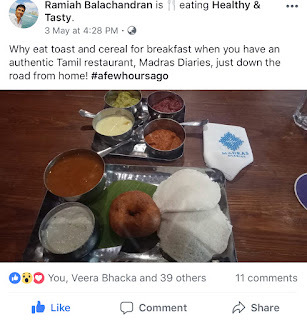 In fact I had missed that at Madras Diaries on my first visit when the idli and the podi – gunutu, kada, curry leaf etc - were served separately. My frame of reference was the soft and addictive, podi and ghee doused idlis of Murugan which I had in Chennai you see. The uthapa at Madras Diaries was a bit more oily than their multi-grain dosa though nothing like the very chikna (shiny) benne dosa that I had during my first visit. That’s understandable as the uthapa is thicker than a dosa and possibly needs more oil to form. Having said that, the texture of the uthapa was firm and very acceptable. I have come across badly made uthapas in the city where a lot of oil is used and yet the texture gets limp and lumpy. No such problems here. The taste again a bit woody/ nutty because of the millets I guess. This time around, I tried out the chutneys that were served on the side with more attention as there was no podi given separately to distract me. Of the four chutneys served, the tomato was nice but I really liked the turai (ridge-gourd) one as it had a nice very cool and summery feel to it and tasted novel. My favourite though, with its tremendous flavour intensity, was the beetroot one where the addition of presumably chilli powder gave a lovely heat counterpoint to the sweetness of beetroot. This had all the makings of a good Carnatic music medley. A teaspoon of the pineapple chutney offered a pleasant sweet and tangy finish to the meal, especially if you didn’t want to order a dessert. I was feeling low when I had stepped into the café on Sunday evening as I had a piercing back pain that day. Yet, I stepped out smiling. That’s the power of good, honest food. Madras Diaries is a bit more expensive than the Udupi joints of Bandra which, in turn, are more expensive than the Matunga ones. Not that they can be compared with each other to be fair. Madras Diaries offers a more modern café like setting with air-conditioning, cheerful colours, a well-designed menu and a clean toilet. The food however, is pretty traditional and sticks to the basics of south Indian food. My yardstick is largely what I’ve eaten in some of the popular restaurants down south. As I said earlier, I do not belong to the south and am no expert. Just an eager learner. An eater! This is not food which has been ‘reinvented’ or been ‘inspired’. Nor is it food which intends to stand on a soap box and give a lecture and moralise. It is not modern Indian food. Or ancient Indian food. It's Indian food, pure and simple. Food that a south Indian granny would possibly serve you with a 100 watt smile to go with it. You could say that it is good and honest food. Some would say, that's the best sort.